KIITEE 2019 Application Form: The last date to fill the KIITEE 2019 Application Form has been extended from 31st March to 10th April 2019. Interested candidates must grab this opportunity in order to apply for KIITEE 2019 examination. Applicants who will successfully fill the form will be further able to do KIITEE 2019 Slot Booking has been made available from 1st to 5th April 2019. The application form was released on November 16th, 2018. The Kalinga Institute of Industrial Technology (KIIT) has released the KIITEE application form 2019 for all candidates who wish to take the Kalinga Institute of Industrial Technology Entrance Exam. The KIIT Entrance Exam application form is now available on the official website of KIIT in the online mode. Those who are applying for KIITEE and filling up the application form must know that KIT does not charge any application fee for candidates. The KIIT application form 2019 must be filled with correct details. There is no KIITEE offline application form. Candidates must ensure that they fulfill all the eligibility criteria before filling up the KIITEE application form 2019. The Kalinga University will not accept any Application form after the final date prescribed for submission. To fill KIITEE 2019 Application Form, candidates must keep ready the scanned images of their photograph and signature and two passport size photographs. Students must make sure to provide only the correct details while filling up the KIITEE application form. The last date to apply for KIITEE 2019 has been extended. Make sure you fill the KIITEE 2019 Application Form before 10th March 2019 in order to apply. Click Here for the Direct Application Form link. Interested candidates will be able to fill the KIITEE 2019 Application Form till 31st March 2019 as it will be closing tomorrow. The Application Form of KIITEE 2019 has been released. The exam dates have also been announced. The exam will be conducted between April 15th 2019-April 24th 2019. Candidates can do the KIITEE 2019 registration through online mode only. No other mode will be provided by the university to fill the application form. KIITEE 2019 application form filling process has been started from 16th November 2018. The last date to fill the application form has been extended from 31st March 2019 to 10th April 2019. Candidates must fill the application form before the last date of apply. Candidates can check their “application status” after completing the application form process. Candidates should fill all the details carefully as no correction will be provided on later stage. It is also necessary to upload the scanned images of photograph, signature and the copy of class 10th mark sheet/passing certificate. There is no need to send the hard copy of the filled-in application form for online mode. 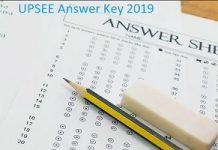 Select the course: The first page that will appear on the screen after candidates have clicked on KIITEE application form 2019 will require the candidate to select the course that they are applying for. After choosing the confirmed course, he/she must click on submit. Fill Details in Application Form: Candidates must next read all the instructions carefully, take a print out if needed and proceed to apply online. Information like personal & qualified exam details, preferred exam centre and full contact details have to be entered by the candidate. Uploading of Images: The scanned images of applicant’s photograph and signature have to be uploaded. The images uploaded to the form must be in the correct specifications as prescribed by the official exam conducting authority. Check all details and submit: Candidates must verify all the details. They can choose to edit the information before final submission. Take a print out: After the final submission, candidates must make sure to take a print out it and keep it safely for future use. Qualifying Exam – Candidates must have qualified 12th examination in 2017 & 2018. Appearing – Students appearing in 12th exams in 2019 are also eligible to apply. Subjects – Physics, Chemistry & Mathematics subjects are compulsory in the qualifying exam. Age Limit – Candidates must have born on or after 1st July 1997. Percentage – Students should have at least 60% marks in the PCM subjects. After candidates have filled up and submitted the KIIT Entrance Exam application form, they will be provided with a facility to check their KIITEE Application Status 2019. They can do by entering their application number. The Application status will inform the applicants whether their application form has been taken into consideration or not. It was important that candidates check their application status before they proceed with the admission procedure. In case, students have lost their application number, they can regain the same by providing their first name, middle name and last name along with their gender and date of birth. After providing all the details, candidates will be required to click on proceed button to find their KIITEE application number 2019. KIITEE 2019 Application form will be available in the online mode only. There is no application fee for students who wish to apply in any course through KIITEE 2019. If the candidate is not eligible and still fills up the application form, his/her candidature will be cancelled during verification. Students make sure to read all the instructions given in the information bulletin before filling the application.